MODEL TC400A/28QUM HIGH PO WERED, CONTINUOUS AND MULTI START BATTERY UNIT The TC400/28 range is designed to give silent, clean power. These 28V DC power supplies can offer both continuous power for a set time, and start power. With a built in 'flashing' light, the units will tell you when it is time to charge them. They also come with a built in voltmeter and an external charger that allows you to leave them on charge when not in use, ensuring they are always ready for operation. 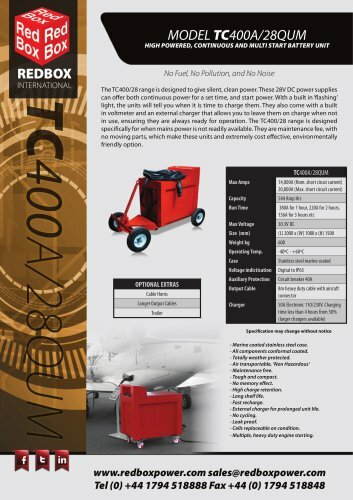 The TC400/28 range is designed specifically for when mains power is not readily available. They are maintenance fee, with no moving parts, which make these units and extremely cost effective, environmentally friendly option. Specification may change without notice • Marine coated stainless steel case. • All components conformal coated. • Totally weather protected. • Air transportable, 'Non Hazardous' • Maintenance free. • Tough and compact. • No memory effect. • High charge retention. • Long shelf life. • Fast recharge. • External charger for prolonged unit life. • No cycling. • Leak proof. • Cells replaceable on condition. • Multiple, heavy duty engine starting.